It's Facebook Fridays! for December 7, 2018! We can help you unlock the secrets to creating a wonderful career as a professional psychic reader! The Lucky Mojo Curio Company is holding a random drawing to give away 4 copies of Valentina Burton's fascinating "Fortune Teller's Guide To Success: Creating a Wonderful Career As a Psychic," an incredible resource of tips, tricks, and clear, straightforward business advice from a famous professional psychic. 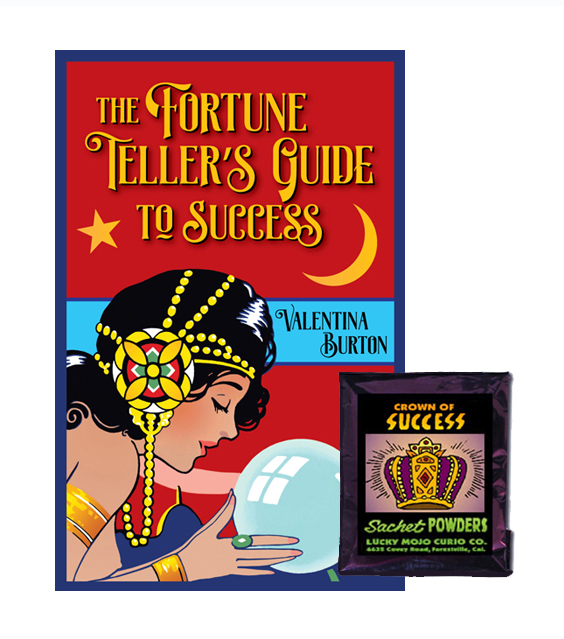 Along with the book, each winner will receive a packet of hand-made Lucky Mojo brand Crown of Success Sachet Powders to dress your Tarot Cards, Crystal Ball, and, of course -- your business cards! First thing tomorrow morning, we will select FOUR winners at random, announce their names here, and ask them to message this Facebook Page with their mailing addresses, so we can send them their FREE "Fortune Teller's Guide To Success" package. Thanks for posting this, Ernie. Looks like folks are entering the contest at a goodly rate, over in Facebook. This contest will be open until about noon on Saturday, Pacific Time. We have a winner! In fact, we have 4 lucky winners! Our Facebook Fridays! winners for December 7, 2018 are: Alissia Jackson, Linda Seabrooks Campbell, Angie Grabarkiewctz, and Kevin Mason.